You’ve probably heard of the terms interior designer and interior decorator used interchangeably. However, these two terms aren’t actually synonymous. There are many similarities between the two jobs, but the credentials and areas of expertise differ. Interior designers often work with the spatial planning of a home and can help renovate interiors, from drawing the initial floor plans to placing the last decorative accents. They don’t just enhance the look of a room; they enhance the function as well. Interior designers also work closely with contractors and architects to help achieve a look that the client desires. They can help you redesign your space from the ground up and is your best choice if you’re working on a remodel and require guidance beyond aesthetics. Their job is to create a functional interior space by understanding how you will be using each room. Typically, interior designers go through a two-year or four-year training program before they can start working. On the other hand, and interior decorator comes into play after the renovations or structural planning is complete. 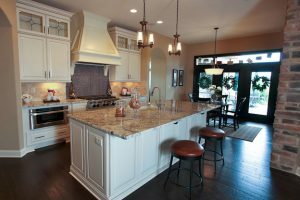 They help clients decide on style, color schemes, purchasing furniture, and accessorizing a room. Interior decorators are often brought in to spruce up an existing room that needs to be redone and can help you bring an entirely new look to your existing space. They are focused on capturing the personality and style you’re going for, and expressing it in your space. Since interior decorators solely focus on decorative details, there’s less of a need for formal, standardized education. Most interior decorators go through a training program to learn about the fundamental principles of interior design. Here at Encantada Designs, we can help out with both of your interior design or interior decorating needs. We provide custom interior design and decorating services to achieve the aesthetic and functionality you want. We’re eager to help all residents of Tucson AZ and the surrounding areas so give us a call today!